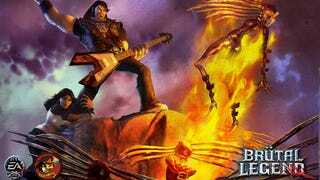 In an open letter on the Double Fine community site Brutal Legend developer and Double Fine head honcho Tim Schafer explains how best to play Brutal Legend and reminds everyone that the game isn't a real-time strategy game. It is a historical fact that it began its life as an RTS game, inspired by Herzog Zwei. But then as we worked on it we simplified it, and simplified it, and focused it more and more on the player avatar and the combat. Every time we focused the gameplay on the action, it became more fun. The end result is something much more action-oriented, and I think, totally unique. If you try to play the stage battles in Brütal Legend as an RTS game then you will lose. First you will get mad, then you will scream, and then you will lose. But if you are open to a new kind of action experience, you will have a blast. Read the full letter, also sent to Kotaku, on the jump. First, a note on the differences: In an RTS game you float high above the action, making one split-second strategic decision after another. You often command individual units to position them based on their heath and context. In Brütal Legend, you make strategic choices once in a while, but then you jump into the battle and slug it out in person. You can fly, but it's mostly for quick scouting and transportation. You will spend a few seconds every once in a while popping into a menu to build troops or pick a guitar solo, but then you should be right back in the action. To play the game most effectively you need to be on the ground with your army most of the time, mixing it up with your axe, and your guitar, but most of all-using your Double Team attacks. Double Team attacks are critical to your success in Stage Battles. Every friendly unit in your army has a move that they can only perform in conjunction with the player character. These moves are extremely varied, extremely powerful, and extremely fun to perform. Sometimes you might simply gain control that unit's weapon-for instance, when a Razor Girl jumps up on your shoulders-but when you do so you increase it's damage significantly. Other units, like the Bride, seem to be just passive, debuffing units most of the time (the Bride slows down enemy units) but when you Double Team with her she has a devastating lighting attack. More complicated Double Teams include the Frightwig, who Ophelia can pick up and throw onto an enemy unit. The Frightwig then wraps itself around the enemy's head and causes the victim to join Ophelia's side in the battle. (You can even use this to commandeer the enemy's Rock Crusher!) The Organist is another passive unit whose Double Team attack allows you to gain direct player control over an enemy unit, giving you command over whatever attacks they normally have. There are important strategic choices to make in Stage Battles. Should I spend my fans to upgrade my stage and gain access to more powerful units, or should I spend it now on cheap infantry? Which fan geysers should I fight for and which should I concede? What is the right time to block my enemies troop production with a Rock Block solo? Would anti-infantry units be better against the current enemy army, or should I switch to anti-vehicle? But these strategic decisions only take a second, and then you should get right back in the action. You should never be up in the air or away from the battle for too long. Some people find it hard to split up the army and give individual orders to individual troops. This is kinda true, mostly because you shouldn't be doing it! That's how you play an RTS game, not how you should play Brütal Legend. True, there are times where you might want to split your army, but it's not common. I play complete Stage Battles most of the time without issuing a single Individual order. Your army is most effective when it's together. The AI automatically groups your warriors into battle formations where the troops support each other. Many of the units buff or heal each other. When they are together they can all be enhanced with a single Battle Cry (or other buffing) solo. And when they are all together and you are in the middle of them, that is when you have the greatest number of options for Double Team attacks. Get in the center of the action! Don't stay in the air too long! For the most part, keep your army together! Don't think of it as an RTS game! If you have tried the Stage Battles before reading these tips, and felt overwhelmed by the controls, or frustrated with the lack of detailed troop controls, I'm hoping you will be able to take this info and go back into the fray and be much more successful. We know that the Stage Battles are tons of fun for most players-and for people who are open to new kinds of action gameplay experiences, they are in fact the core of what makes Brütal Legend a fun game experience and unlike any other. I'll see you online! *Early in the game, low-level troops are vulnerable to enemy Avatar harassment; make sure you watch over them and protect them if necessary. *Don't play timidly. The game is about projecting power and taking control of territory. If you try to play defensively and stay in or near your base, you'll be at a resource disadvantage. *If you set the beacon on a building, your dudes will attack the building until it's destroyed, ignoring any incoming attacks. *The right solo played at the right time can be devastating - don't forget you have those tools at your disposal! *Ironheade is extremely mobile - use this to your advantage. *Razor Girls' Double Team is great for dealing with early-game Avatar harassment. *Remember that you can upgrade your level 1 troops once your stage hits level 3. If you've spent the game massing up those small infantry, an upgrade can really pay off. *Gravediggers, while more numerous, have lower health than other basic melee troops. They may need extra support in the early game. *Use your debuffers (Bride, Organ, and Dirgible). They're powerful, and the Bride and Organ stack their debilitating effects. *Bride's Double Team is great for dealing with early-game Avatar harassment. *Your hierarchy units (Nuns, Warfather, and Overblessers) are extremely vulnerable while alone. They're much safer when they're surrounded by minions, because they get a small stacking healing bonus from each nearby minion. *Punishing Parties' Double Team is good for dealing with early-game Avatar harassment. *Remember your Superior and Divine troops - for example, if you build a Warfather, he can then build a Superior Nun, which in turn can produce Superior Soul Kissers and Punishing Parties. Superior and Divine squads are more powerful than the basic troops, but cost the same!